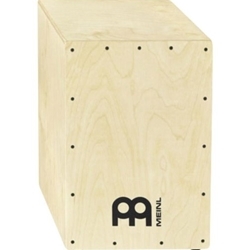 The Meinl Headliner Birch Cajon is a beautifully crafted instrument which features a fully adjustable, birch front-plate. Birch is a wonderful; almost naturally EQ'd wood that is capable of everything from crisp highs to booming low, and everything in between. With a few turns of a screw driver you're able to easily tune this baby to your like, giving you just the right amount of snap. Cajons are not only perfect for Latin and Afro-Cuban music, but work great in acoustic settings as well. Their warm, tonal range, and rich sound make them perfect for low volume gigs where a full kit just won't cut it.